We were delighted to hear in The Guardian earlier this week that The Space and our PUSH ME films will now have an afterlife beyond the original designate 31st October deadline for the pilot project. We are currently negotiating how this will effect how and in what way we are able to show our PUSH ME short films and documentary beyond the platform and how we might as part of the extension, build a body of constructive feedback on our commission journey for The Space. 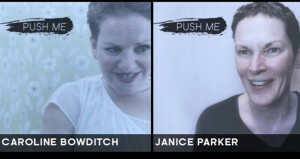 We were also delighted after an unnerving wait to see a further 2 films appear in the PUSH ME Collection – The Journey. It was reassuring to find that they stand the test of a little delay with Caroline Bowditch and Janice Parker exploring the unknown consequences of what the push of this summer has meant for them both. In Janice Parker’s film, we see her playfully question whether she ‘may have gone too far this time’. We always wanted this second set of films to focus on our artists in that quizzical mid project head space, indispersed with the work itself as they pushed it out onto various stages, platforms and parks this summer. So too Caroline Bowditch’s film on the morning of her premiere who having queried whether she had bitten off more than her chew at rehearsals caught her in delicious contemplation resigned and excited by what the work would reveal in the weeks and months ahead. This just keeps pushing me. I can’t go back actually now, I just have to keep going forward. I really feel like I’m at the beginning of something pretty magical from here on and I’m not quite sure where it’s going to end up. Later this week, we’ll be giving you the low down on the showcase programme already lined up for this extraordinary body of work. This entry was posted in Caroline Bowditch/Leaving Limbo Landing, General, Janice Parker/Private Dancer, The Space. Bookmark the permalink.